Credit card rate trends were a mixed bag in the last month. While average consumer credit card rates remained steady, average rates for business credit cards and student credit cards posted significant increases of more than 0.40 of a point. The latest Credit Card Monitor calculations show that the overall consumer credit card rate fell by 0.03% since mid-February, moving from 16.70% to 16.67%. The lack of movement in consumer card rates since last month's high-water mark isn't so surprising, considering that credit card companies were widely seen to have raised rates well before February 22 in anticipation of the regulatory changes. Subcategories of the overall consumer rate, including reward cards, non-reward cards, and cards for consumers with excellent credit all remained fairly steady. Excellent-credit borrowers who are focused on finding the lowest credit card rates can still see offers with an average APR of 11.07%, the average minimum rate of non-reward consumer cards in the survey. The average rate for business card holders, in contrast, jumped nearly half a point in both the reward card (increase of 0.47%) and non-reward card (increase of 0.49%) categories. This rate hike on business cards can be attributed to credit card companies' need to plug the profit hole created by Credit CARD Act provisions. 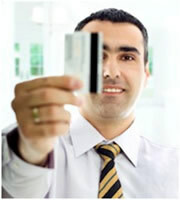 The Credit CARD Act applies to consumer but not business credit cards. Although the National Small Business Association predicted in the Wall Street Journal that significant changes to business credit card rates wouldn't show up in the near term, this mid-March rate survey indicates that the trend may very well be underway. The average rate for student credit cards in the survey increased by 0.42%, to 16.24%. The Credit CARD Act placed greater qualifying restrictions on students under 21, requiring such applicants to show proof of income or come with a co-signer. This rate increase may reflect card companies' tightening of their lending terms to this population. It remains to be seen if credit card companies will continue this rate increase, tighten other terms such as credit limits, or possibly begin to drop credit cards aimed at students. In pinpointing a single "average" rate, IndexCreditCards.com attempts to include all of the various rate tiers that card issuers offer based on an applicant's credit history, as well as the different rates associated with non-reward versus reward cards. Consumers with better credit histories can often find offers well beneath this average, while those with bad credit histories will likely be offered rates higher than the average. 0 Responses to "Credit Card Interest Rates Monitor - March 15, 2010"